Franco-American Linden Malegarde travels to Paris to celebrate with family his father’s 70th birthday to find himself trapped in a flood and more than one family crisis preventing their evacuation. Over a few deluge-filled days, the Malegarde family bursts at the seams, spewing secrets and long-held hurts, with deadly descriptive flashbacks and a horrifying centimeter-by-centimeter account of a real-life flood. De Rosnay’s writing flows like the Seine spilling over its banks, sparing no characters of their integrity in situations that require fortitude beyond their human frailty. She takes on more than one social issue, in Linden alone being an outsider in more than one way, in more than one country, his saving graces being a successful creative and having a supportive partner. 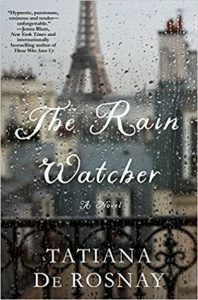 Readers of historical fiction, Francophiles, and fans of Liane Moriarty and Thritty Umrigar will appreciate this novel. I was fortunate to receive an early copy of #TheRainWatcher from #St.Martin’sPress through #NetGalley.